After an interminable year of private alphas and betas and gammas(? ), Elite: Dangerous is finally out. That makes it the first of the three massive space games (Elite, Star Citizen, and No Man's Sky) to officially release, and thus I've spent quite a few hours recently holed up with a HOTAS, a glass of eggnog, and my trusty spaceship. 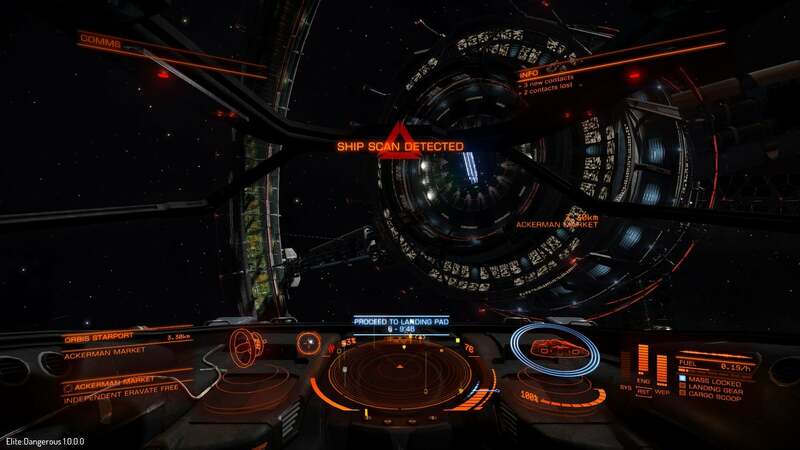 I don't think it's appropriate to smack a score on Elite: Dangerous yet, in the same way I wouldn't smack a score on any MMO. It's early days for the game, and I don't think the full scope of what Frontier has planned is even close to realized despite the 1.0 status. That won't stop me from talking about my experience though. It had been a while since I played Elite: Dangerous. I spent a lot of time with the alpha, a fair number of hours with the beta, and almost zero hours with the gamma release. This was important because when I loaded up the game, the first thing that hit me was the sheer enormity of Elite: Dangerous. I knew this, of course. They'd repeatedly hammered in that they'd created a scale replica of the Milky Way galaxy, with its 400 billion explorable star systems or whatever. You quickly learn, however, that your brain has no comprehension of "400 billion." I can understand that number logically, but trying to imagine it—to picture it in my mind—is like trying to imagine how many cells are in my body. Or how many needles are on the average, non-Charlie Brown Christmas tree. ...And here we are zoomed out all the way. Note: That blue marker is in the same spot in both images. 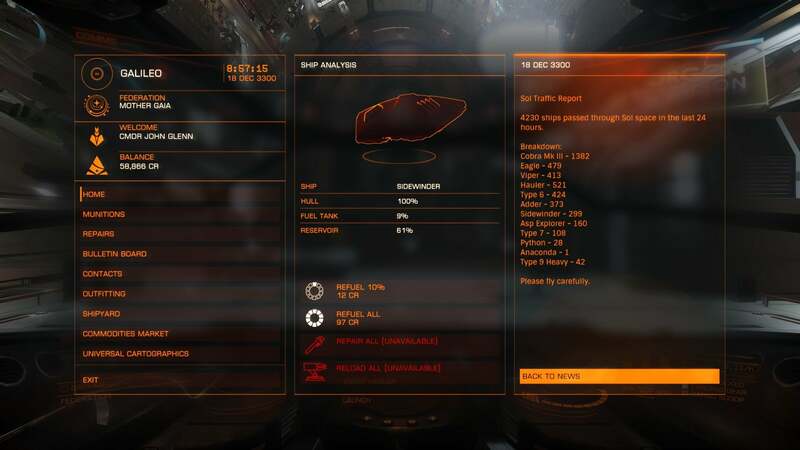 That's what we're dealing with in Elite: Dangerous. All those star systems are ripe for exploration. 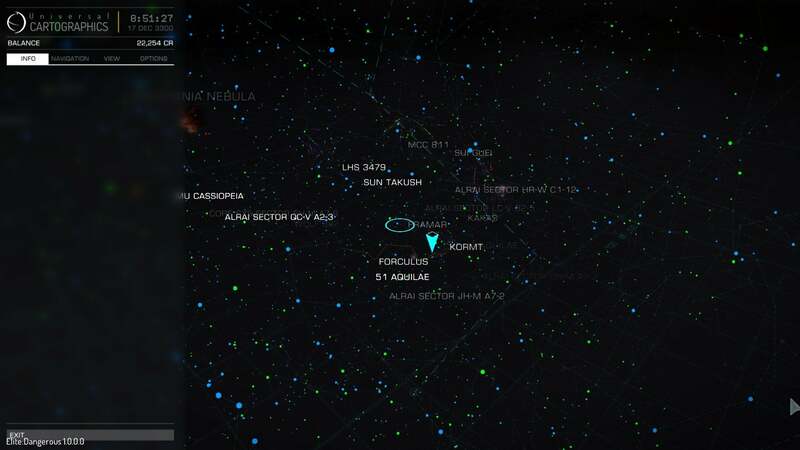 There's (literally) an entire galaxy out there to uncover! So of course, I went home. 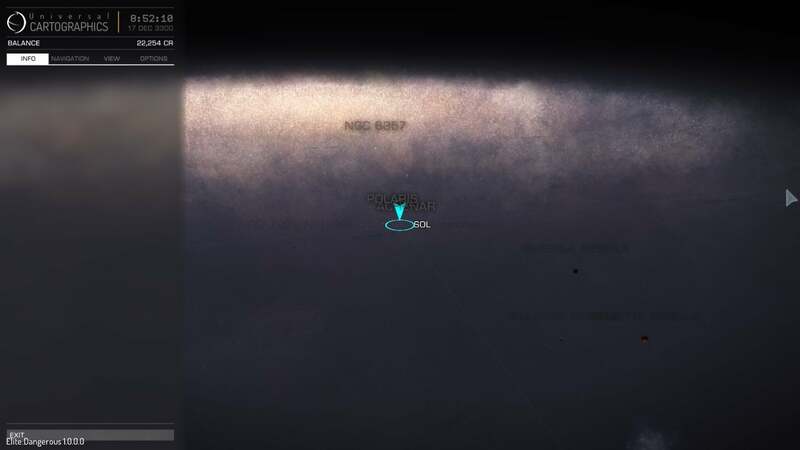 The Sol system. Earth. It was harder than I thought. Thanks to Frontier, I didn't need to jump through any hoops with the Federation to get a permit for the Sol system—usually a necessity. I didn't count on spawning into the galaxy so far away though. 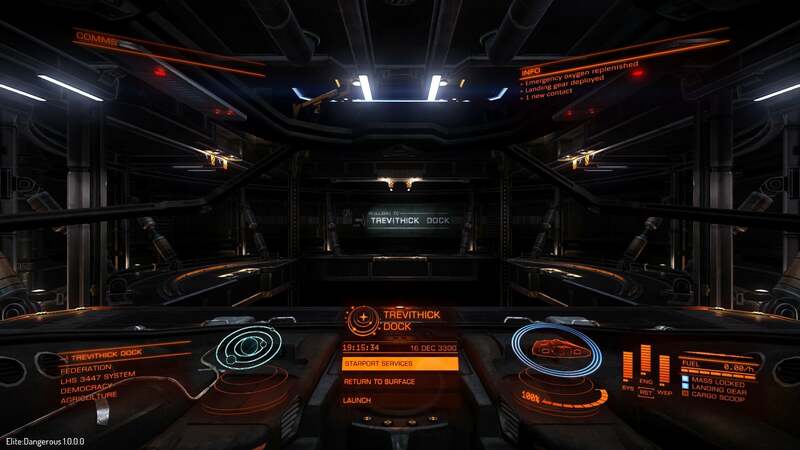 After typing in a half dozen names for my commander (all taken) I arrived at Trevithick Dock in my humble Sidewinder, a fresh-faced rookie named John Glenn. 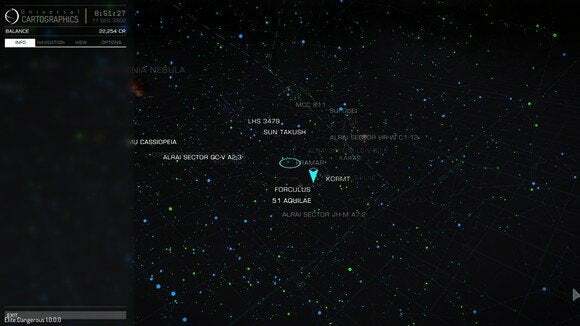 A quick flick of the stick brought up my map and from there I found out I was only...so far away from Sol that I couldn't even plot a course there. Fantastic. Thus did I learn an important lesson early on. 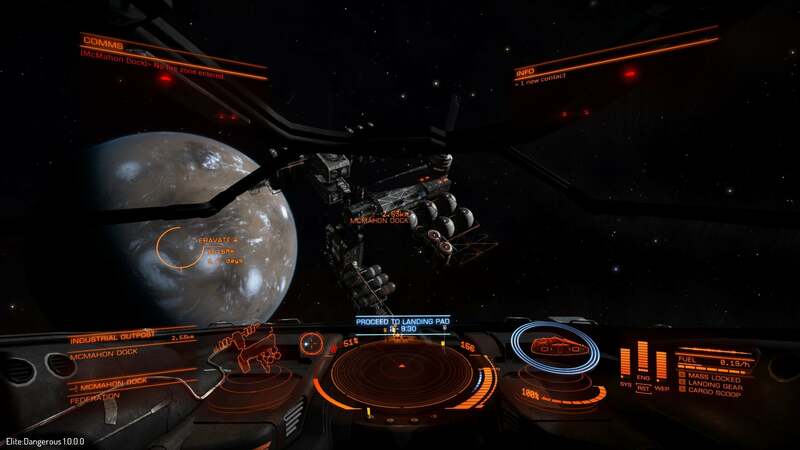 Elite: Dangerous is unforgiving for newcomers. And space is big. There are a few tutorials accessible from the main menu in Elite: Dangerous, but they're really only to familiarize you with the controls—how to fight, how to dock your ship, how to fly. 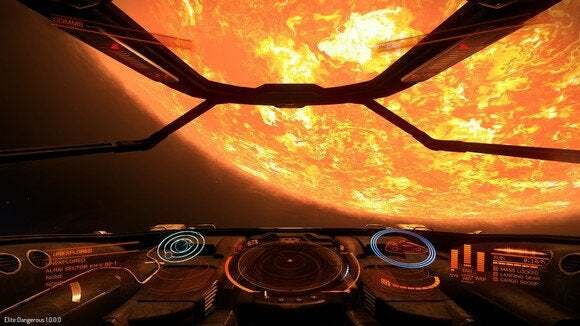 Jump into Elite: Dangerous proper, however, and you'll quickly find that the biggest challenge in the game isn't how to play on a mechanical level but how to play the damn game. Paralysis of choice is an understatement. There's no direction given when you come into the game. Just the vastness of space awaits. Fighter? Trader? Explorer? Up to you. That's refreshing, in a way. A space simulator that doesn't hold your hand? That doesn't baby you each step of the way or force you in certain directions? In 2014? Oh boy, it's like a tall glass of water on Arrakis. Or Tattooine, if you want an example where I don't have to hotlink Wikipedia. But it's easy to feel lost. Should you trade? Should you fight? Should you just aimlessly explore? And for that matter, how do you trade? Who do you fight? Where do you explore and what does exploration even really mean? 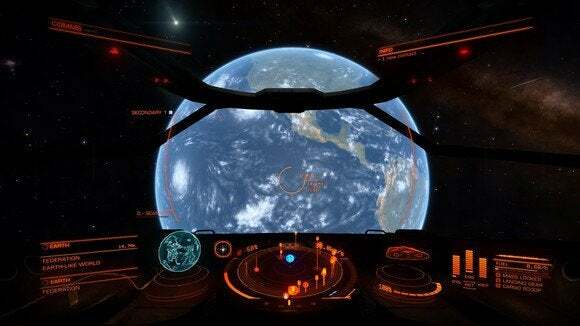 Obviously some of these core systems are "explored" already considering there are dozens of people flying around them, so what does it mean when I also explore them? None of those questions are answered, especially if you're (understandably) a newcomer to space sims as a genre. You make your own goals, or you never make it out of your home system. It's not that Frontier isn't trying to make the game approachable. The developers made it clear there's some sort of meta-story going on in the background right now with multiple factions fighting for possession of the Empire. "That sounds interesting," I thought, so I headed to the nearest Empire-controlled system I could find. And it took me 11 hours of semi-serious system-to-system jumping to get there. And then I got there and didn't have a clue which faction was which, or why to help one faction or another, so I gave up and left. "One week into the story, and you have already decided the outcome of two civil wars! Senator Denton Patreus was dealt a bloody nose in the Jera system, with Commanders weighing in to ensure that the incumbent Jera Social Democrats remained in power despite Patreus' best efforts. The Emperor himself has been making quite an impact for such an allegedly frail man. Days after appearing in the Senate to pronounce his son and heir Harold 'not of sound mind', Hengist Duval announced his intention to marry his sweetheart from their younger years, Florence Lavigny." And so on and so forth. It goes on like that for a while more. That all sounds great! Two civil wars! Intrigue in the Imperial Court! British spellings of words like "maneuvering." Fascinating! The problem? I didn't experience any of this. 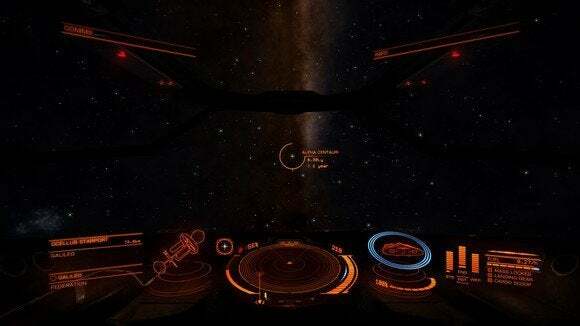 My journey through Elite's Milky Way has been very quiet. Occasionally a ship tries to interdict my poor Sidewinder and I flee. Sometimes I come across a smuggler or a massive capital ship. But most of my time has been spent with a post-rock soundtrack playing on Spotify in the background, or an episode of Black Mirror spooling out on a secondary monitor while I mindlessly jump from one system to another—from Yakabugai to Potriti to Apoyota to Kremainn for hours on end. Systems with names as impenetrable as the political machinations contained therein. Pausing only to refuel and sell off the navigational information I obtained from uncharted systems. Two civil wars? Hell, one civil war? I don't even know where to start. Even reading the galactic news feed hasn't helped steer me in the right direction. That's fascinating in its own right, because I love the idea of exploring this space. As I said, it's refreshing in a way to have a game that wants me to actually work for my rewards. It's not a long-term hook though. There are only so many times I can jump system-to-similar-looking-system before I start to question why I'm doing this. What is my role in the Milky Way? What is the purpose of good ol' John Glenn, who so far has done nothing but explore? Is that a goal in and of itself? And so eventually I found my home. I pulled up the map and made the last few jumps from Lacaille 8760 to Ross 154 to Barnard's Star and, finally, Sol. I flew past some of humanity's first space stations, located in orbit around our moon and Earth and bearing powerful names like Abraham Lincoln and Galileo. I smiled at the other blue dots soaring towards Earth—each another pilot like myself, heading home. I looked down on Earth. I located San Francisco and looked down at "myself." I thought about all the science fiction I've read and watched over the years—the pioneers of Star Trek, the fatalism of Hyperion, the epic span of Dune, the peaceful wanderings of Doctor Who , the humanity of Foundation, the tragedy of The Forever War, the self-deprecation of Hitchhiker's Guide. 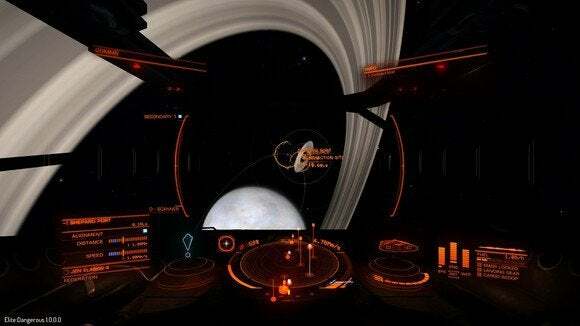 Elite has the potential to include bits of all of these. It has the potential to be an epic work of science fiction in its own right. I get the feeling the players are ready, and the space is certainly ready. But as I looked down on Earth, I mostly felt afraid—afraid that I had exhausted another goal. Overwhelmed by the thought of concocting some new scenario to play out, just to keep myself entertained. Where would I go next? What would I do? And if I flew out to the middle of nowhere, would I ever make it back? 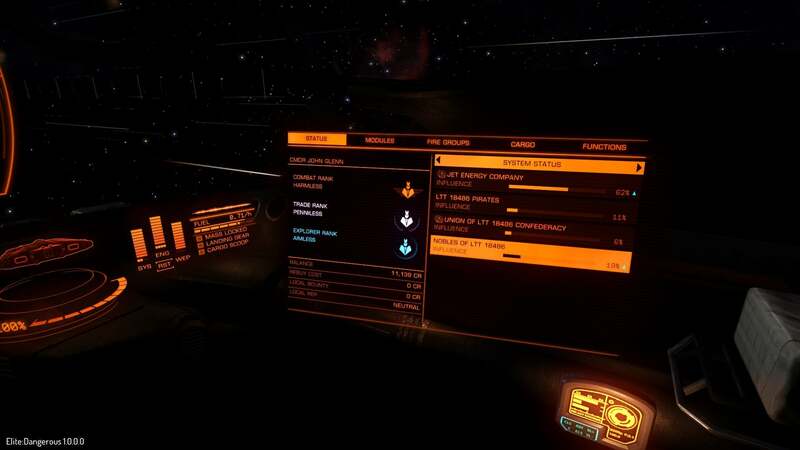 Expect more impressions on Elite: Dangerous as we keep playing. For the record, it's still one of our favorite games this year even in this early state, as evidenced by its honorable mention status on our Game of the Year list.